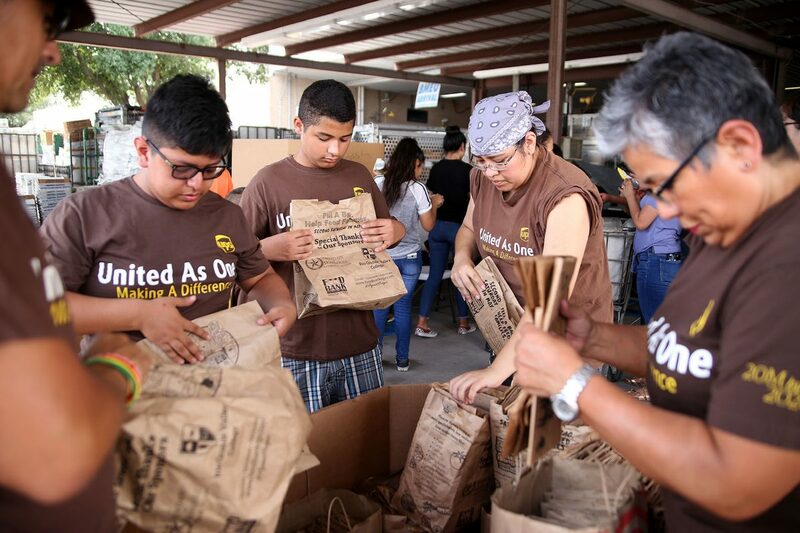 Volunteers organize empty brown bags which once held donated food during the Stamp Out Hunger food drive on Saturday, May 12, 2018 in McAllen. 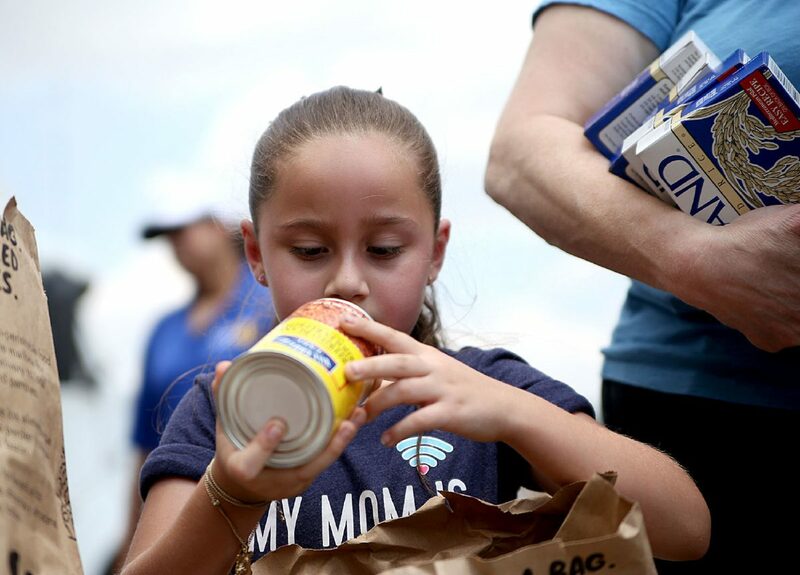 MCALLEN – One in two children in the Rio Grande Valley go to bed hungry on a daily basis with one in four people wondering where the next meal might come from. Saturday marked the 26th annual “Stamp Out Hunger” campaign across the nation. The campaign began by the National Association of Letter Carriers’ for wanting to do community service. A pilot drive was conducted in 1991 with 10 cities and proved to be successful to become a nationwide effort. The national drive became effective in the spring of 1993 and would be held on the second Saturday in May with a goal of each state in participation. DeAnne Economedes, interim CEO and COO for the Rio Grande Valley Food Bank said the food donation will serve people throughout Hidalgo, Cameron and Willacy counties. Sara Hernandez checks the expiration date on the can of beans on Saturday, May 12, 2018 in McAllen. “We’ve got people collecting all this food. We can’t do all this work without the volunteers and so every hour that each one of these hundreds volunteers that we have out here today helps us provide 105 meals,” Economedes said. “As summer time is coming, more families will have their children at home and we have a lot of working families out there that the struggle is very real. 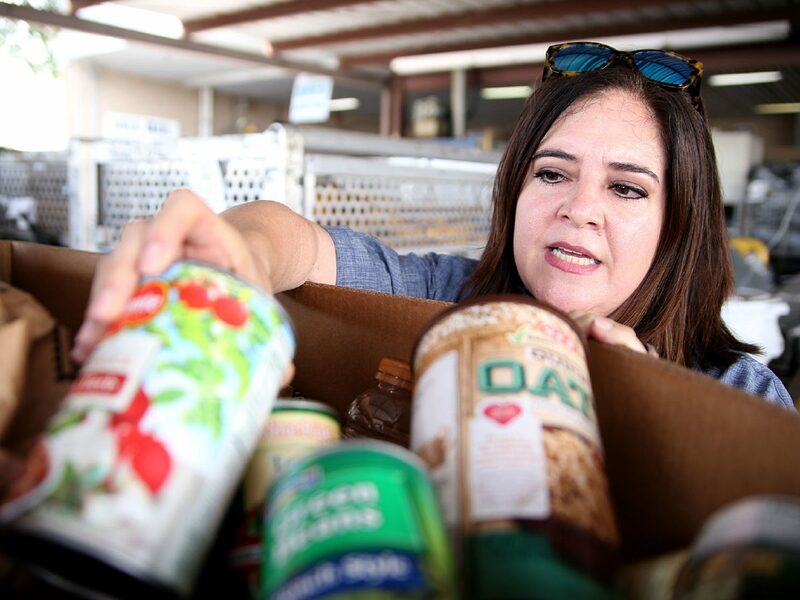 “The community and across the country with the Rio Grande Valley is taking a stand to stand beside the food bank to fight hunger,” Economedes added. This past week, a brown bag was distributed through letter carriers and left at residents’ mailboxes. The resident then fills up the bags with canned foods or anything bottled and was asked to leave them next to their mailbox Friday evening. On Saturday morning, the letter carriers then collected the brown bags and returned them to the main post office on Pecan, where Food Bank volunteers were waiting to transfer them into large bins to be taken to the Food Bank in Pharr. The Food Bank, which serves Hidalgo, Cameron, and Willacy counties, feeds approximately 42,000 on a weekly basis through the 250 partnerships like church pantries, the Salvation Army, Boys and Girls Clubs of the Rio Grande Valley and adult day cares. Some of the items collected were non-perishable items – canned items, easy open tops, protein, such as canned tuna, canned chicken, chili, beans and cereals. Angel Sanchez, a Pharr resident and volunteer, has been assisting in the program for almost seven years and likes helping other people. Mission Girl Scout members from Troop 1065 were some of the volunteers who assisted by sorting food in the large boxes. “We want to make a change in the community,” said Girl Scout Kaitelyn Cortez. The food drive is the nation’s largest single-day drive. Last year, 75 million pounds of food was collected nationwide with the grand total of 1.6 billion pounds of food since beginning in 1992. The Food Bank also has an emergency pantry, where anyone who needs food assistance can stop by throughout the week. It also runs a senior program that feeds more than 7,000 elderly clients each month. Currently, the program has 2,000 available slots for more seniors to register. For more information on the RGV Food Bank, visit, www.foodbankrgv.com or information on Stamp Out Hunger, visit, www.helpstampouthunger.com. This story was updated to reflect the scope of the food drive’s reach, and to correct the number of elderly clients assisted by the Food Bank RGV’s senior program.